Welcome to Pick and Draw! Pick and Draw is a fun, one-of-a-kind drawing game that teaches you how to make very creative cartoon faces. It is simple and easy to use providing endless hours of fun and learning. In five minutes or less you will know how to play! Pick and Draw can be played by one or more people and is an excellent way to engage in creative and imaginitive thinking. This makes "success" possible, providing a good kind of confidence to encourage continued learning. Best of all, it’s a lot of fun! 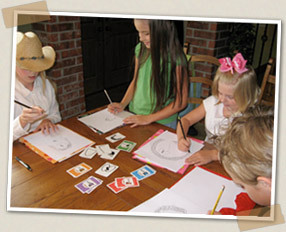 Pick and Draw is not a gimmick… and yes, it only costs $10! 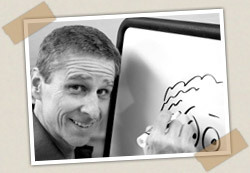 Pick and Draw was developed to be used in my presentations to children of all ages at public libraries and schools. I knew that most kids that I drew with at these one hour sessions I would never see again, and wanted to help them unlock new pathways of visual thinking…empower them, and do it in an unsuspecting fun way. That is when Pick and Draw was born. I made a pro-type deck and began trying it. I saw over and over that there was something very wonderful that happened when kids played it, even the adults at those events benefited. I noticed a "creative energy" that erupted at some point during the drawing time. I saw shy kids suddenly get animated about what they had drawn and even wanted to share it with the whole group. Parents that decided to draw with the kids enjoyed it so much that they even got on the distractive side! I saw lots of smiles and heard alot of laughter. And best of all, I heard from the librarians and teachers weeks later that the kids were still drawing and still excited about their pictures. That is when I knew that I needed to get Pick and Draw out to people all over the world. It seemed to have a life of it’s own. Thanks for taking a look around the Pick and Draw website, remember you can order Pick and Draw for only $10 here, and if you have any questions please send me a message!